Social listening and social monitoring – sounds like the same thing, right? Wrong! Although the two terms are often interchangeably used, they have different nuances. Read on to better understand these two important concepts. Social listening and social monitoring – sounds like the same thing, right? Wrong. Although the two terms are often interchangeably used, they have different nuances. In many discussions of big data analytics, the terms social listening and social monitoring appear to be describing the same social media tool. However, others insist that there are differences between the two, but there’s a fair bit of debate on how to make the distinction. Some experts think that it is important to distinguish between the two as this will directly affect the different approaches of a brand marketing strategy, while others argue that even though there are differences between the two , they don’t matter much. This article aims to clarify the distinctions between social listening and social monitoring, and then to explore how the resolution of these two concepts are crucial to understanding social media tools and ultimately to setting your social media marketing strategy. Someone once put forward a handy metaphor for recognizing the fundamental difference between the two concepts: “Social monitoring looks at each tree in the forest one by one on the ground, and social listening looks down at the entire forest from a high altitude.” Thus, social monitoring helps discover the individual cases while social listening can analyse the reasons behind issues. Specifically, social monitoring primarily tracks any direct mentions of your brand and identifies relevant social media postings. Social listening, on the other hand, tracks public opinion on your industry, competitors and target audience from a broader perspective. Social listening can go one step further and actively explore online discussions, discovering trends and calculating sharing rates. Therefore, while social monitoring can be regarded as part of social listening, the two are not equals. When formulating a strategy, because the nature of social monitoring is more focused on capturing the more reverberant voices on the internet, it is easier to collect recent data and to seize or create short-term opportunities. Social listening, after sampling, produces long-term cumulative data which by nature facilities a more favorable long-term understanding of the target audience and helps create long-term returns. In short, social monitoring is like interviewing individual audience members and social listening is akin to polling a mass audience. At present, no social media tool explicitly claims to offer either a social listening or a social monitoring program as these definitions depend on how the programs are used and how the data is interpreted. Therefore, whether one employs social listening or social monitoring depends on the user. Social data analysis implies that the collected data needs to be edited or reviewed before it can be meaningfully applied. With the additional collection of results and further evaluation, the data will eventually become social media intelligence that can serve as an important reference for business decision-making. For example, when a large amount of outdated or unrelated data is collected on a topic through social media tools, social data analysis is needed to filter and classify the data. Therefore, whether one employs social listening or social monitoring, one also needs to utilize social media analysis to develop meaningful insights. This can be likened to difference between the ear which is responsible for hearing sounds and the brain which has ability to analyze and turn the resulting sound into meaningful information. 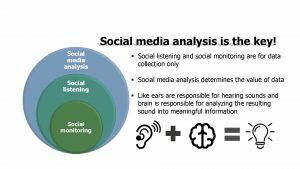 Therefore, the simple way to distinguish between social listening and social monitoring is the different levels of carefulness in collecting information. What is more important is that the data obtained is examined by professional data analysts and classified according to a specific agenda, interpreted and categorized as qualitative and quantitative data, and that this process of analysis is further studied. The use of social listening or social monitoring will achieve different strategic effects. This depends very much on the needs of brand development. However, apart from understanding the two data collection approaches, we need to focus on social data analysis because data collection is only a means to the ultimate end of gaining insight into the market. In this regard, the process of analyzing and interpreting data for further research is the key. Social Listening and Big Data – what’s the connection?